A delicious and healthy snacks you and your kids will love! In a small bowl, mix ground flaxseed with 3 tablespoons water and set aside. Fill a large pot with water and 1 tablespoon salt. Bring to a boil. Add broccoli florets to the water and blanch for 3 minutes. Drain well and dry broccoli with paper towel. Finely chop broccoli. Make sure the pieces are very finely chopped so they easily blend with the rest of the mixture. Alternatively, you can use a food processor and pulse the broccoli until it’s finely chopped. Add chopped broccoli and all remaining ingredients to a large mixing bowl. Mix thoroughly. Using a soup spoon, scoop about 1 1/2 – 2 tablespoons of the mixture into the palm of your hand. Gently mold into a tater tot shape and place on the baking sheet. Repeat this step until all the mixture has been used. Bake in the oven for 20-25 minutes, until crispy and and golden brown. Serve. 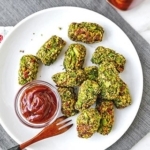 These yummy broccoli tots will keep in the fridge for up to 3 days.